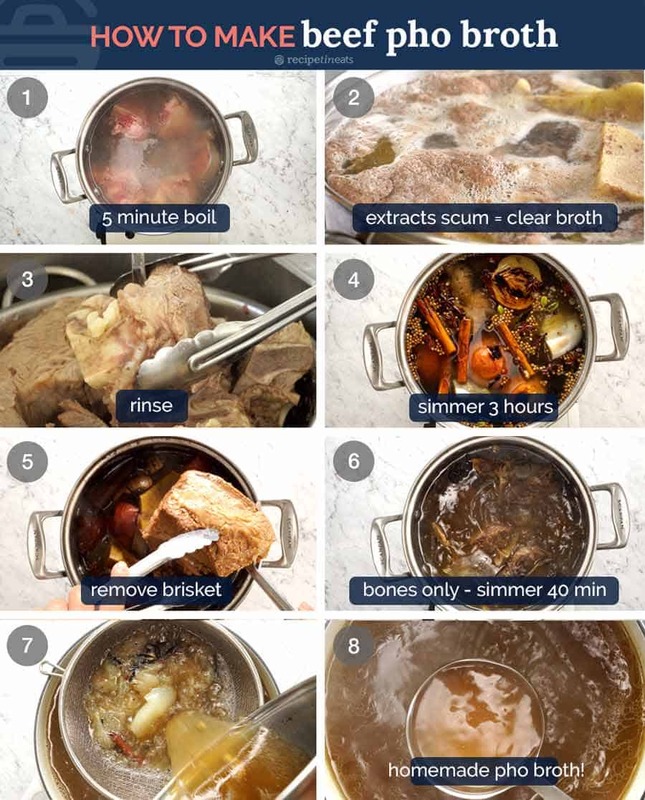 The ONLY way to get enough beef flavour into the broth is to use a combination of meat AND bones. 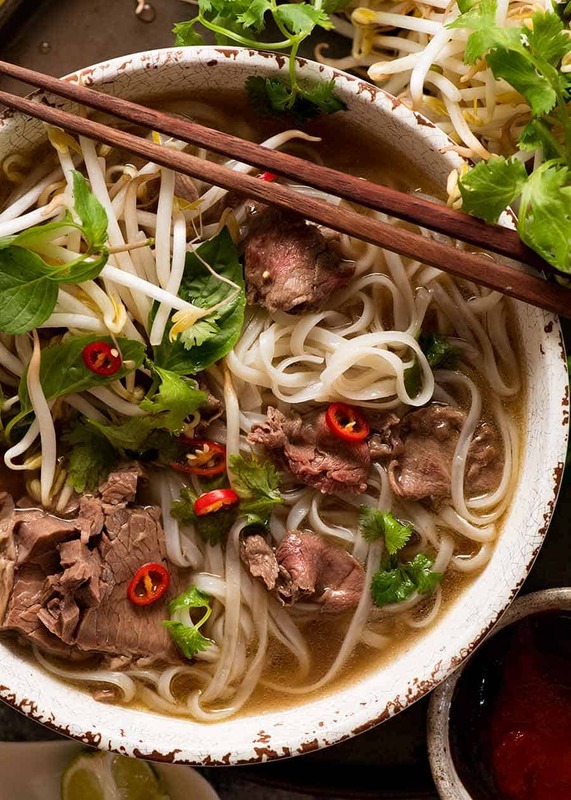 You will NOT get enough flavour into the broth using just bones – trust me, we tried multiple times. 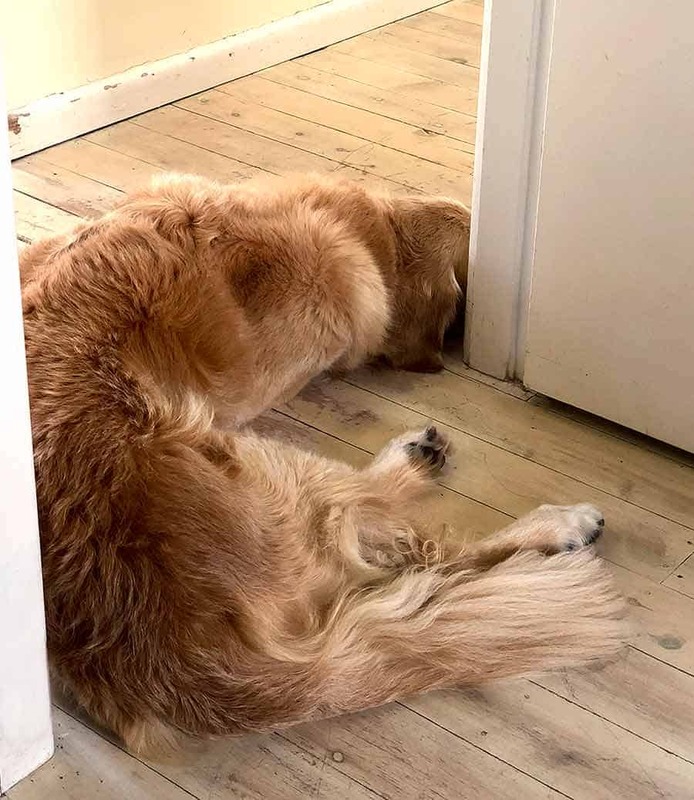 And it distresses me to see so many recipes online using just bones! 1kg / 2 lb marrow bones – bones like leg, shin and knuckle, with less meat on them but are quite big and are cut to reveal some of the marrow inside so it can leech into the broth. 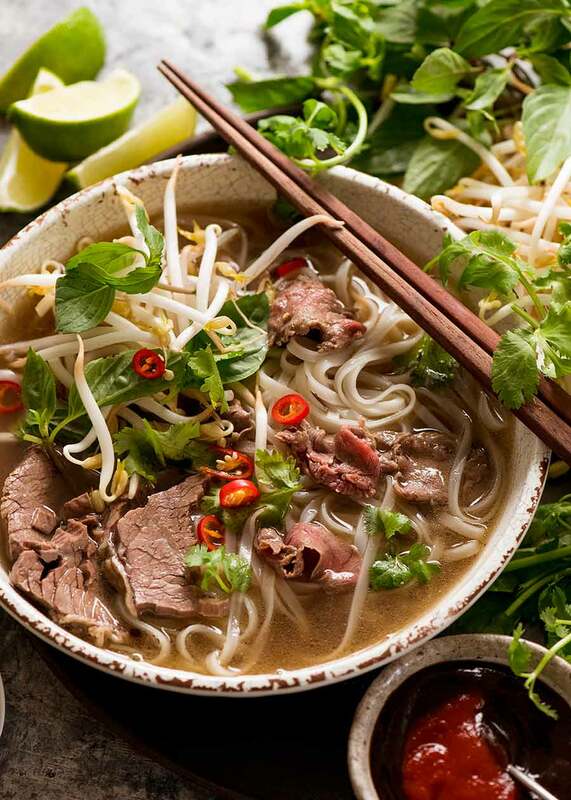 This provides the least flavour but it adds that essential hint of richness in Pho broth. Best sub: more meaty bones – lose a bit of richness but still super good. PS I’m also #4. Because yes, I’m that immature at heart. Place onion and ginger in pan cut side down. Cook for a few minutes until it’s charred, then turn. Remove and set aside. 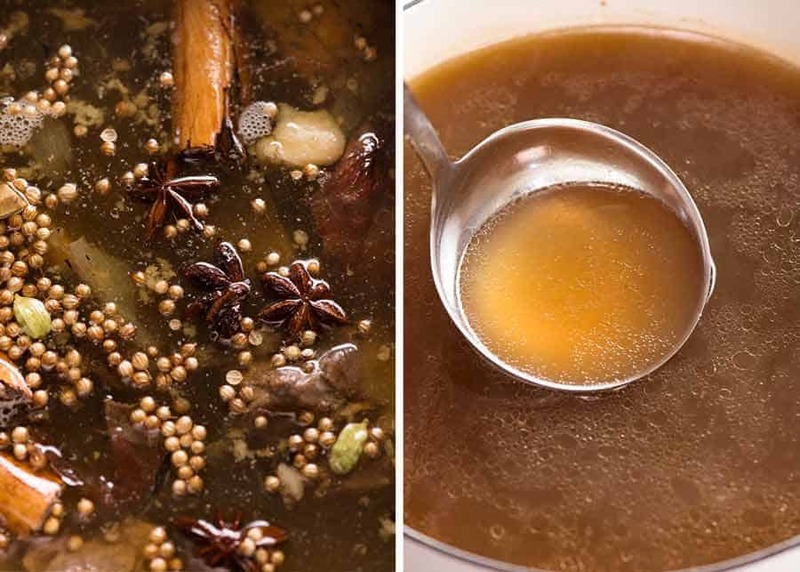 Add onion, ginger, Spices, sugar and salt – water should just barely cover everything. Ladle over about 400 / 14 oz hot broth – will cook beef to medium rare. 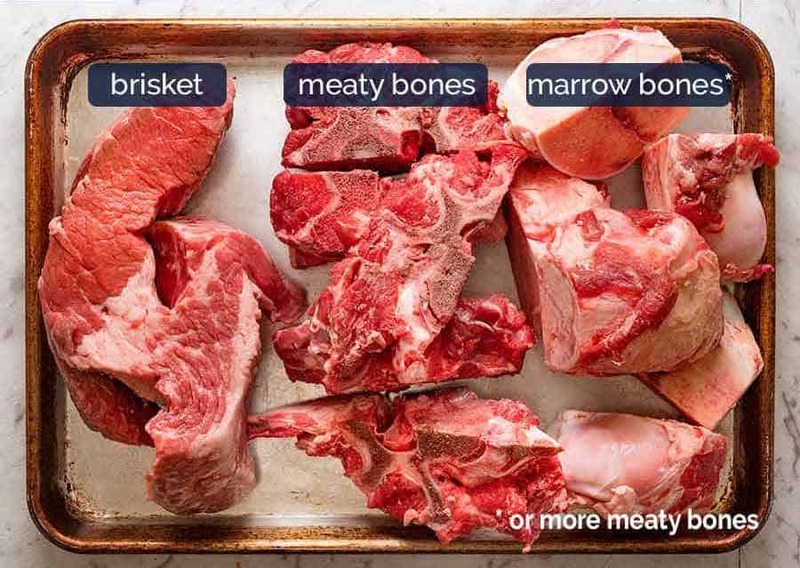 Brisket – don’t skip this, adds way more flavour into broth than any bones and other beef cuts like chuck (brisket has intense beef flavour). 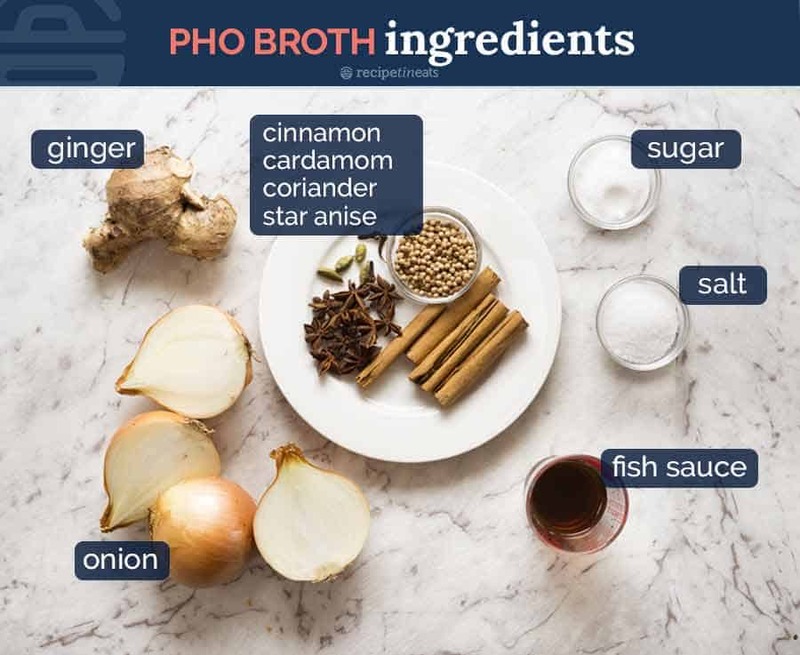 If omitted, broth is weak. Leftovers not wasted – see in post for easy, really terrific ways to use up. Also FREEZES for months. Marrow bones add richness to the broth but not as much flavour. Use leg bones, knuckle, anything that is cut in a way so you can SEE some of the marrow (so it can leech out). Australia – meaty bones used are called “soup bones” at supermarkets. Brisket and marrow bones from butcher. 2. Fish Sauce – can sub with light soy but flavour will be a tiny bit different. Still VERY tasty. 3. 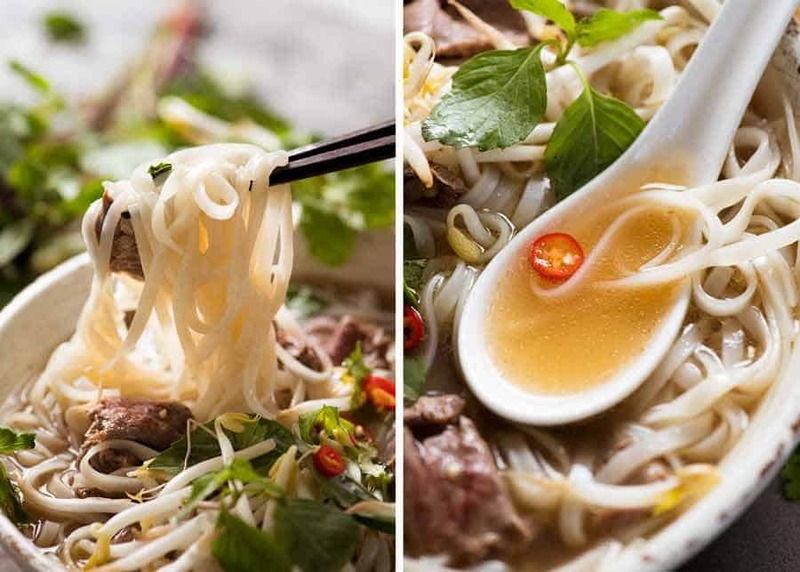 Noodles – any flat rice noodles fine here. 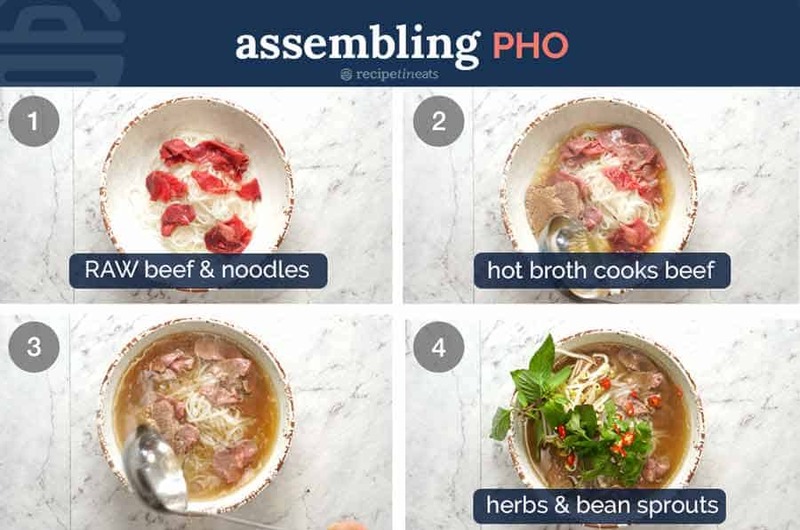 Use medium size – not super thin like vermicelli or really wide like Pad See Ew. 4. Finely sliced beef – Partially freeze (about 30 minutes), then slice as thinly as possible. Could also buy thinly sliced frozen beef from Asian butchers. 5. 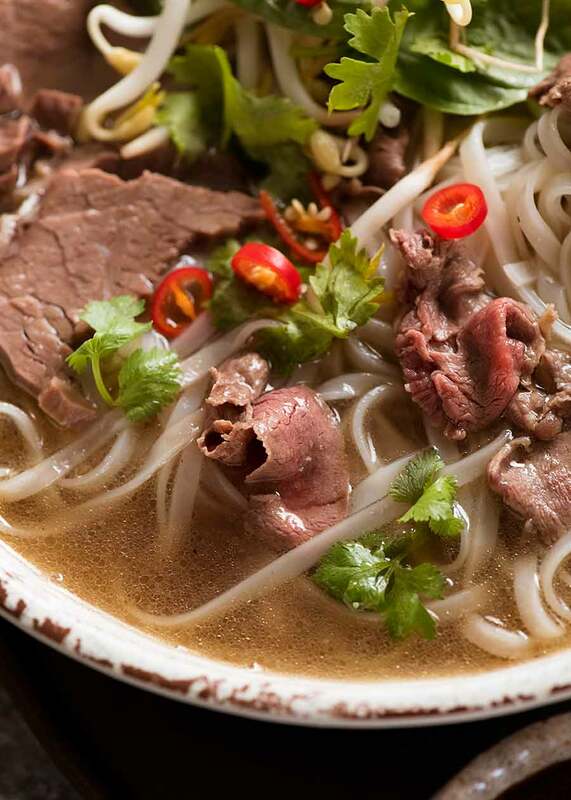 Serving – Traditionally, the soup is served with just noodles, broth and beef with all the Toppings listed above on the side. 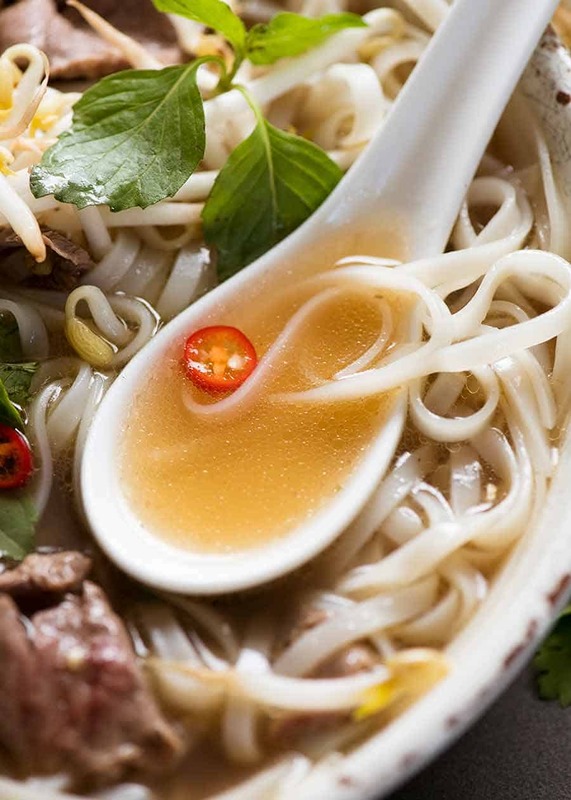 The idea is to help yourself to Toppings as you eat the Pho. 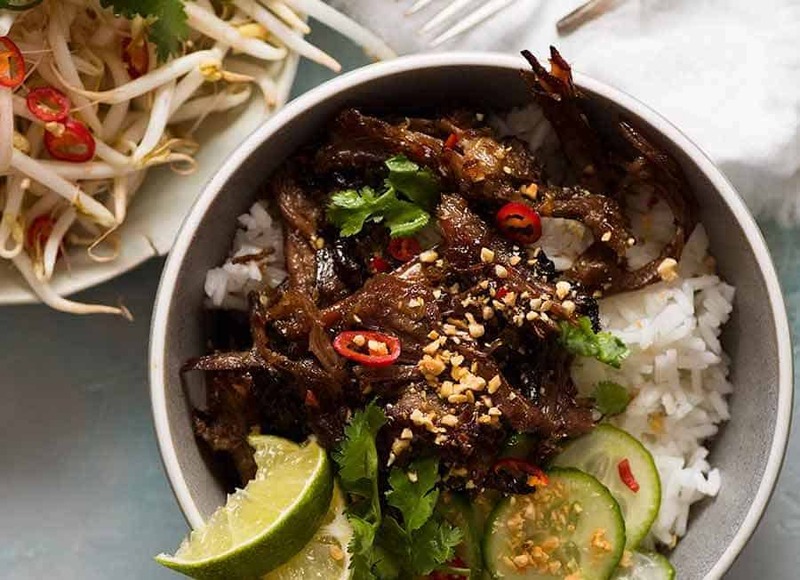 While a few thin slices are used for the Pho topping, I always end up with 500g/1lb leftover and I have a Caramelised Vietnamese Shredded Beef recipe coming on Friday which I created especially to use up the remaining brisket. Those golden crispy edges are amazing!!! 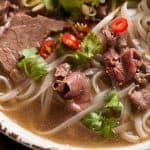 The post Vietnamese Pho recipe appeared first on RecipeTin Eats.